Lovely clean apartment that was close to everything, lots of shops, restaurants and supermarkets within a few minutes walk. Secure complex. Lovely walk along the seafront to the marina. You do need to take washing up liquid, dish cloth, tea towels ice cube trays etc as these were not provided. I would have given this full stars however a week before our arrival the owner informed us the pool was to be emptied and closed during our stay due to maintenance, we had two children with us so to say we were disappointed was an understatement. A pool was a must for us! We still had a nice time and got on with it so hence the 4 stars. Thank you very much for your kind review under the unfortunate circumstances of the pool being closed. We were only informed just before your arrival. I must apologise about the dish cloths and tea towels, this must have been a oversight from the new member of our management team, as we do provided these items. I am very pleased that overall you had a great holiday and thankfully the refurbishment of the pool is nearly complete and the complex is looking great. Thank you for looking after our house during your stay, you were very nice people to deal with and best wishes for the future. Just come back from this property nice and clean and very central to everywhere would definitely stay here again had a lovely time. Thank you for your lovely review and taking such care of the house during your stay. Really enjoyed our 8 day stay in this very comfortable house. Had every thing we needed, such a good idea having your own sun beds , never needed to worry about not getting space round the pool. We felt very safe in this complex. Was near to all local shops and restaurants. Great place to come and explore the island. Thank you so much for your lovely review and we are pleased you had a great time. We would like to say thank you for taking such care of our property and we would love to welcome you back anytime. Just a quick email to say we all thoroughly enjoyed our stay in Number 16 Amuley Mar. The house is lovely and had everything we needed. Hopefully we'll get to visit again sometime soon. Thank you so much for your lovely review. You were perfect guests and we would like to thank you in taking such care of our house. We would love to see you again, should you decide to return to Fuerteventura. This property is offered in excellent condition, close to the beach and many local restaurants with menus suitable for kids. 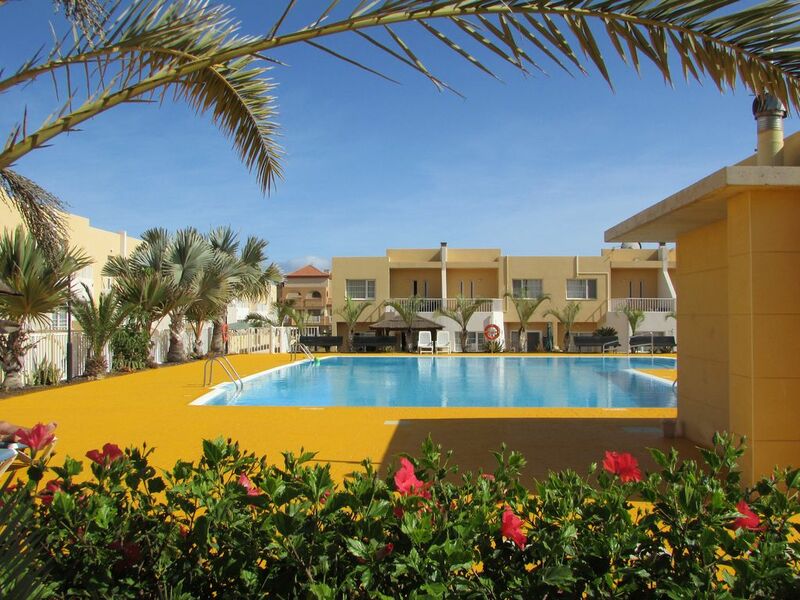 The pool area is well maintained and the property offers the use of it's own sun loungers too. In April there were usually only 2 or 3 families around the pool and so it felt almost like our own pool at times. Lyndsey always replied promptly to e-mails, making the whole process seamless. Graham met us promptly on site upon arrival with our keys, the property is only ~15 minutes from the airport and we accessed it quickly and cheaply using the local taxi service outside the airport. I would highly recommend this holiday to any family wishing to take a relaxing break in a fantastic resort. Thank you for such a lovely review Clare and we are pleased you had a great time. We would love to welcome you back anytime, should you decide to return to Fuerteventura. Lovely house, well equipped and very clean. Lyndsey was fantastic to deal with. Ideal for our family the gated complex made it feel very safe. Pool area was fantastic never too busy and having our own sun beds was great. Fantastic location close to lovely restaurants and the beach. The only issue we had was that the house did get very hot and although there were plenty of fans,keeping cool was difficult. But this didn't spoil a great holiday in a lovely house thank you.